About 1-1/2 years ago, I made a post mentioning that I wanted to try to find a BX psionics solution. Let's face it, OD&D and AD&D psionics is unwieldy, cumbersome, and downright confusing. More importantly, there is nothing about the psionic system in those systems that feels anything at all like normal combat in D&D. But I can't blame Steve Marsh (who is co-credited with Brian Blume for psionics' as it appears in Eldritch Wizardry). In a 2009 interview with Grognardia, Steve lamented, "a character class I designed was taken apart and turned into the psionic powers... I wanted a character class, but the editor decided that the abilities belonged available to everyone, except for elves." 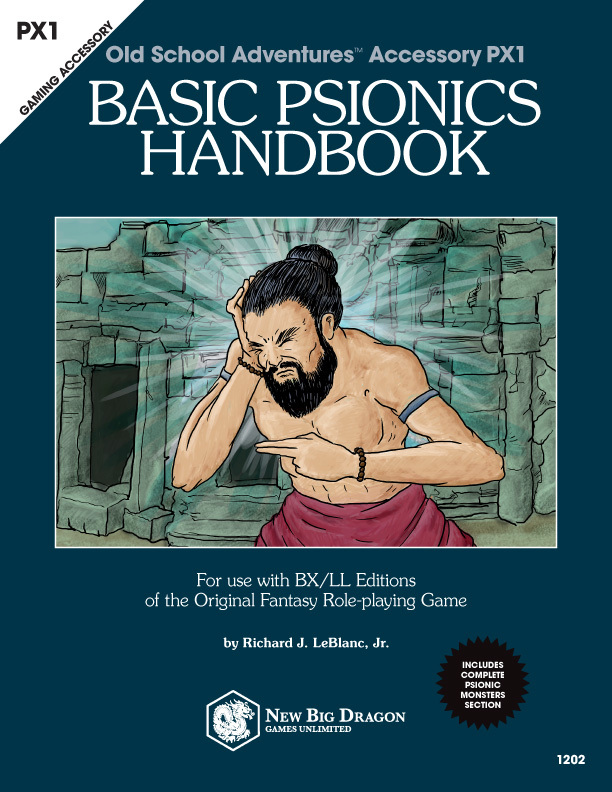 IMO, psionics (for PCs) were most successful in older editions when treated as part of a character class. The Psionicist character class was introduced in Dragon Magazine #7 (in an article by Arthur Collins), and re-worked/re-introduced by Steve Winter in AD&D2's The Complete Psionics Handbook. But regardless of how successful these may or may not have been, they did not address an underlying issue... the system of psionics inherited from AD&D by way of OD&D is simply "unlike" what players expect in D&D — especially BX D&D. 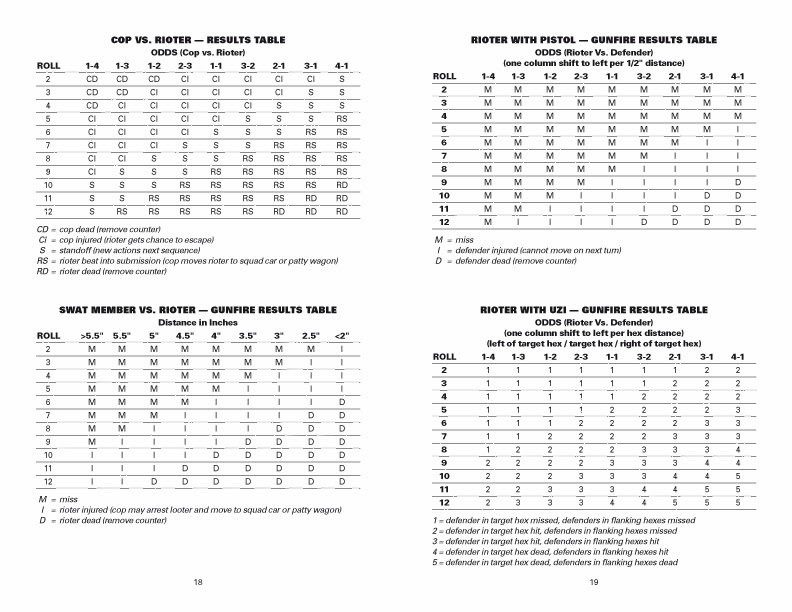 The number of Wisdom points a character has directly affects the number of Psionic Energy Points the character gains at each level — e.g., characters with a WIS of 16-17 get twice as many PEPs per level as characters with a WIS of 9-12, and high levels that gives wiser characters a deathly advantage; choosing to be a psionicist with that low of a Wisdom score would just be a VERY poor decision. All mental attacks (vs. psionic or non-psionic characters) are made using a single Mental Attack Table (which looks like any other D&D attack table)!!! The various combinations of psionic attack and defense modes simply become modifiers "to hit" on the attack table. Non-psionic characters get a saving throw based on their INT (like OD&D) and psionic characters lose PEPs based on the type of attack/defense and the level of two psionic parties involved. That's all I've got so far, but I feel good about where it's going. You're quite right in pointing out that this is a vendor difference issue. I'm going to reorder your full order, after having a word with our printer to make sure that they handle it personally, and point out that a print setting is causing a systemic issue. 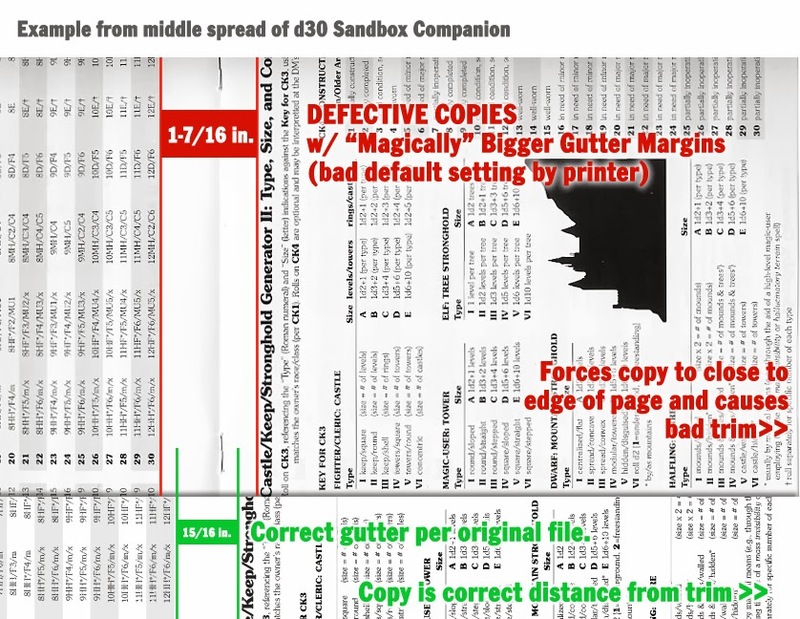 If you're copies of the d30 Sandbox Companion looked like this, you probably got defective copies from the same vendor. And if you ordered other (different) letter-sized saddle-stitched (stapled) books as part of the same order and you got them from this vendor (Lulu farms orders out to whichever independent vendor grabs the order first), then ALL of what you ordered was probably faulty. POINT OUT THE ISSUE AND TELL THEM YOU WANT A REPLACEMENT COPY!!! They are having to replace my entire order (2 copies of Valley of the Five Fires, 2 copies of Ogress of Anubis, 1 copy of the d30 DM Companion, and FOUR COPIES of d30 Sandbox Companion). As far as I'm concerned, it's too late and Lulu took too long admitting the issue was their vendor. I'm still moving ahead with moving my inventory "in-house" and shutting down my Lulu storefront soon. First off, I can't believe it's been so long since I did one of my "Really Old, Old-school Artists" posts. Second, cannot believe I have not heretofore covered Edward Burne-Jones. 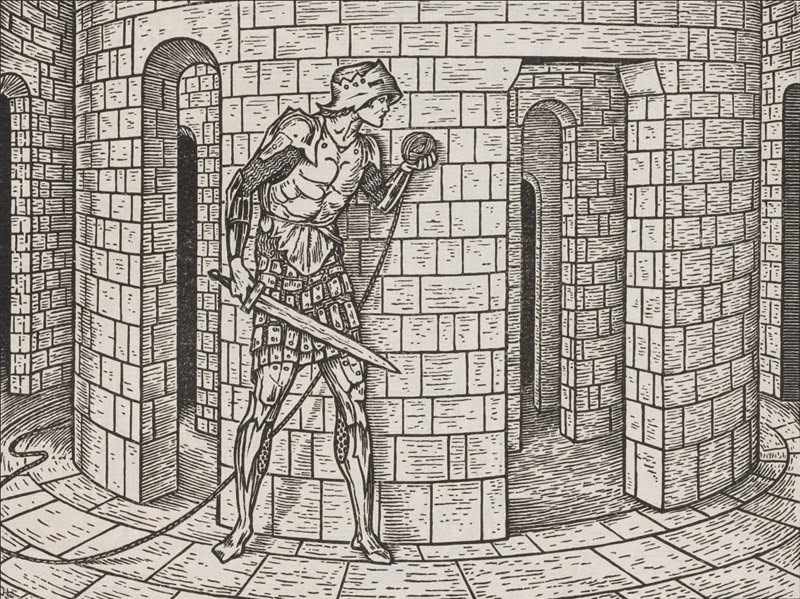 One of my earliest posts on this blog (back in my second-ever month of blogging) I wrote an article entitled "How the Industrial Revolution Inspired the Original Fantasy Game: A Brief Timeline." 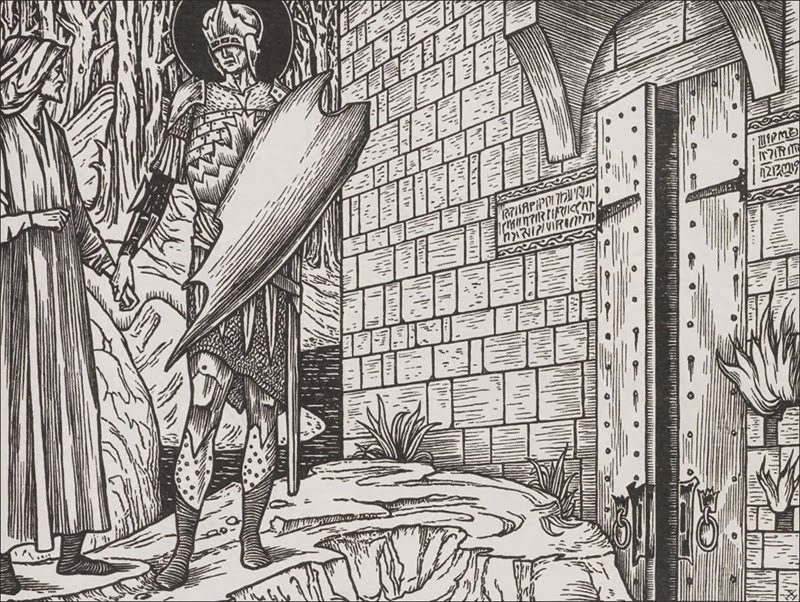 In that post, I spoke about the importance of writer/type designer/book publisher William Morris, and how his book The Story of the Glittering Plain was a direct influence on Tolkien, and through Tolkien was an influence on Gygax, and through Gygax was an influence on modern RPGs. 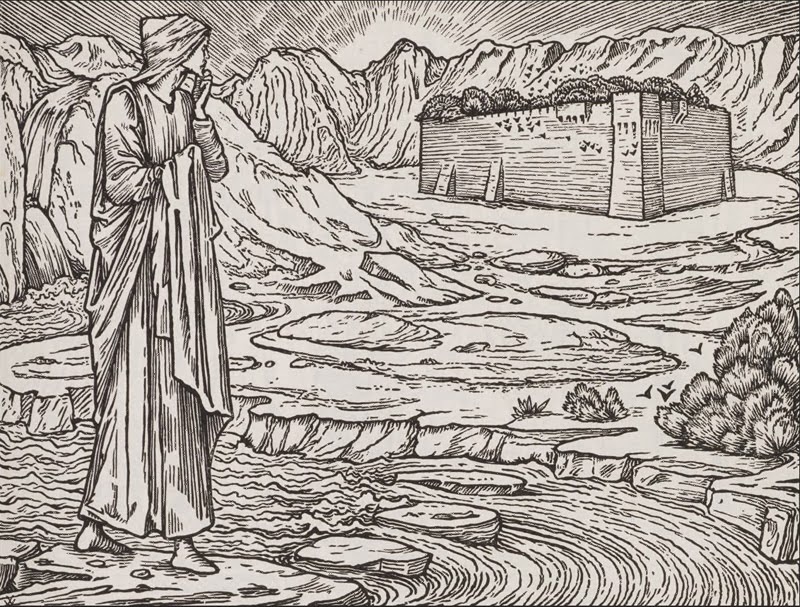 Edward Burne-Jones was one of Morris's right-hand men. 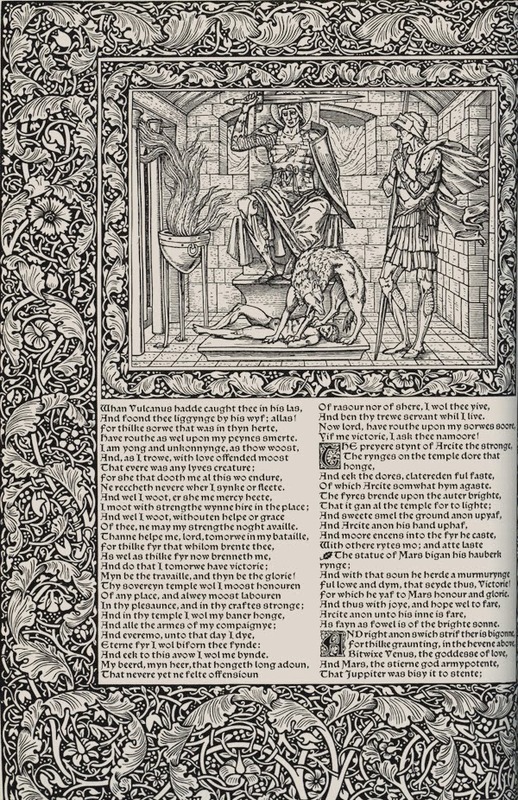 Not only was Burne-Jones a co-founder of Morris, Marshall, Faulkner & Co. (a furnishing and decorative arts manufacturer), but one of Morris's main book designers for the Kelmscott Press (founded by Morris in 1891 to publish limited-edition, illuminated-style print books). Burne-Jones (or, more formally, Sir Edward Coley Burne-Jones, 1st Baronet) was an artist/designer with toes in many pools (painting, stained glass, book design & illustrator, et al. ), and his work in those pools was directly tied to the late Pre-Raphaelite movement. The Pre-Raphaelites were seeking to bring more realism to the "contrived" (my word) nature of the classical approach favored by the Mannerists that succeeded Raphael and Michelangelo. 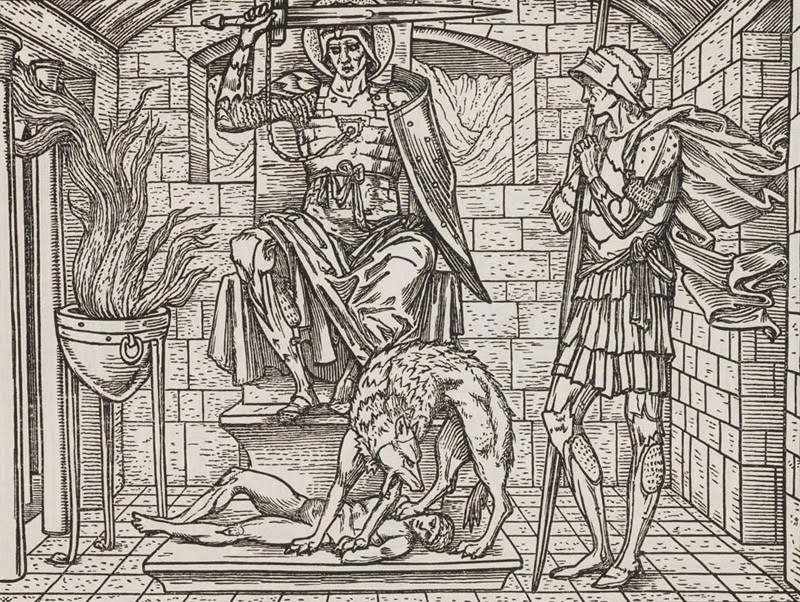 Eventually, some of the PR's romantic fascination with medieval culture started to clash with this realism, leading to a falling out between the realists and medievalists among their number, Burne-Jones siding with the latter when the group split. 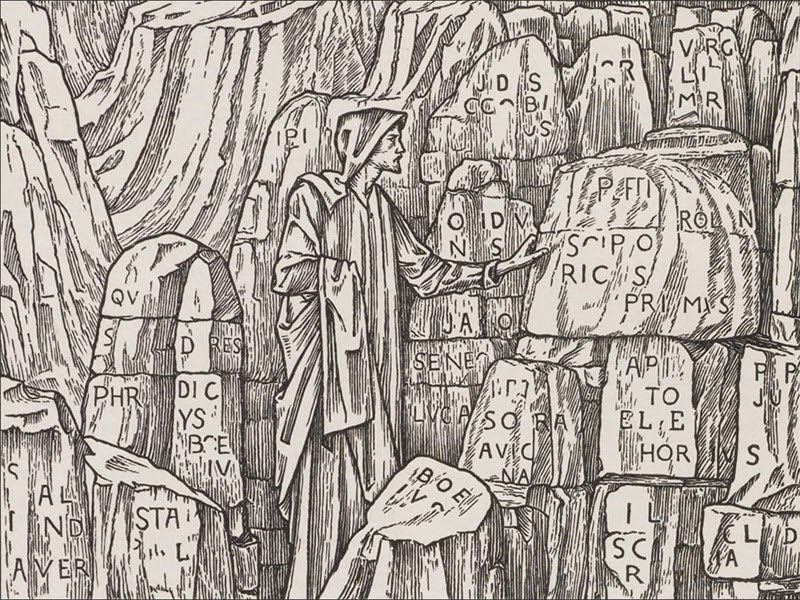 Why do I go through this whole bit of background before I show you some cool old illustrations? 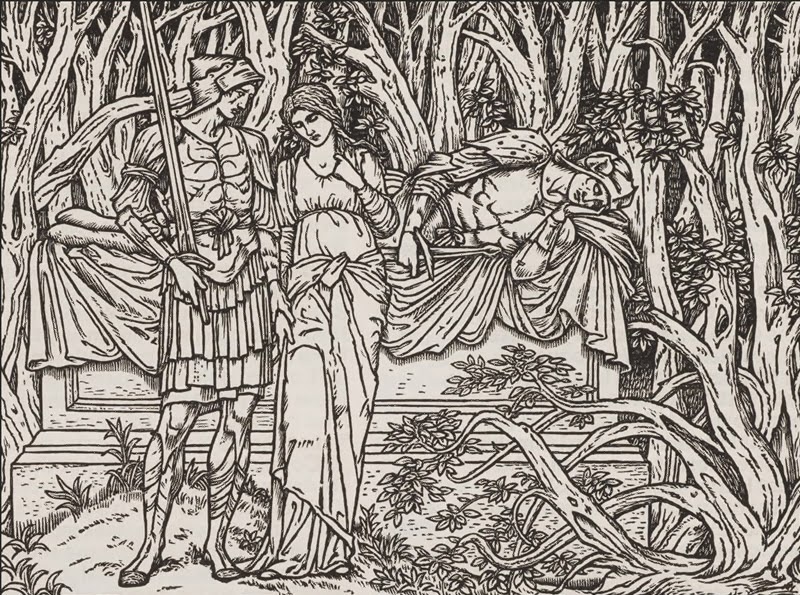 Because if Burne-Jones were more of a realist than medievalist, I doubt I'd be featuring him at all. Why? 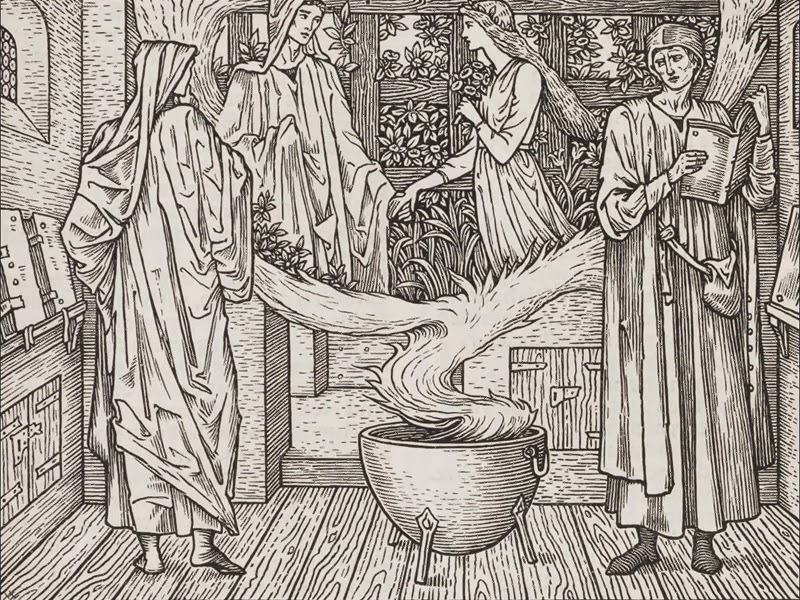 Because I'd rather see Burne-Jones illustrate the works of Chaucer (see below) than Samuel Taylor Coleridge. 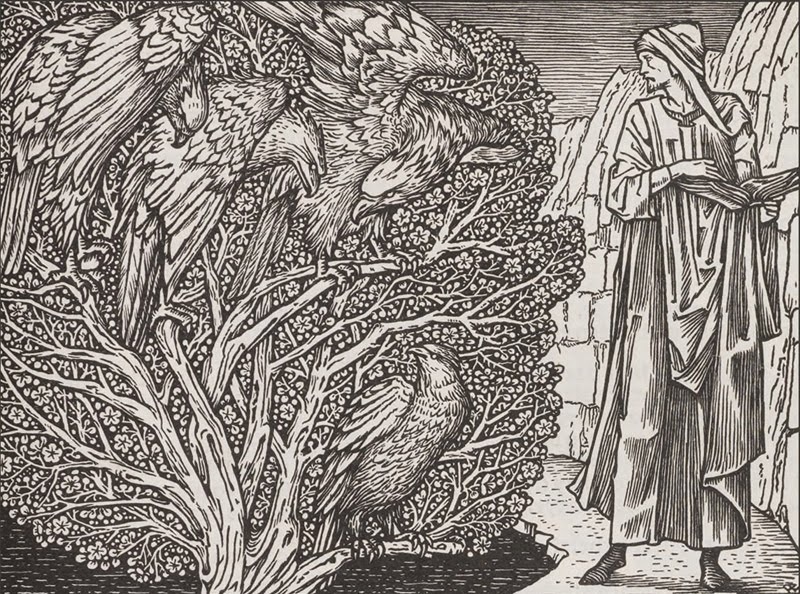 Don't get me wrong, I've seen some very cool illustrations by Burne-Jones's contemporaries for works by Coleridge, and at some point will most likely feature a few of those illustrators on this very blog. 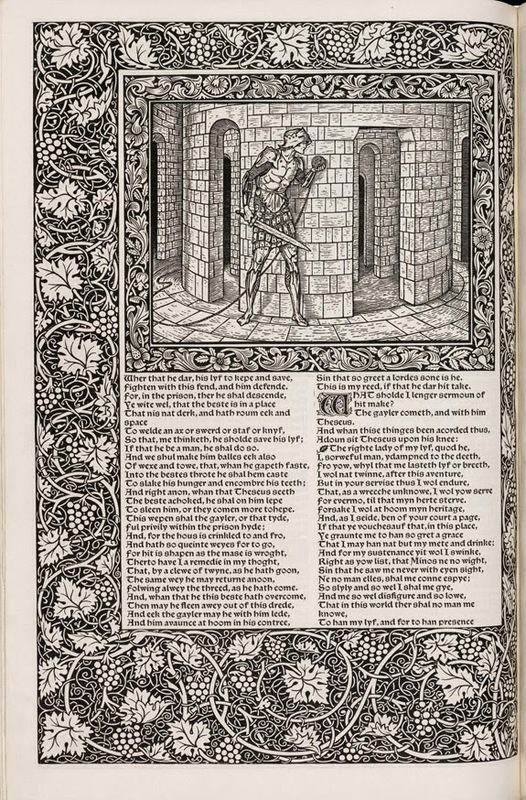 But... when you look at BJ's images below (all of which were taken from The Kelmscott Chaucer, published by William Morris's Kelmscott Press in 1896), you can see how most of the illustrations almost suggest encounter or plot points for an adventure. Wait-wait-wait! Before you start freaking out, that doesn't mean my print offerings will be going away. Long story short. I have been involved with an ongoing "battle" with Lulu.com for almost a month now, regarding a "less than satisfactory" product order I received (10 damn copies of my own titles, no less!!!!). I won't get into the details, and will say nothing more than this... I believe that one less-than-stellar vendor doesn't realize his default settings on his printer are "off" (which is adding inside gutter margin, and forcing the book to trim WAY too close to the copy in the outside margins). Also, this vendor is making obvious production "shortcuts" (e.g., when you print a heavy-as-hell film/UV style cover stock, you HAVE to score it if you want the product to fold well). Problem is, and I'm probably the only one complaining about this vendor (because many people getting books just don't know better). The bigger problem is this- because Lulu.com farms out to whichever vendor claims the order, there is no quality control. On a related side note, many of you may have noticed my absence in posting over the last couple of weeks. I've been finishing up a big pro-bono project for my wife's school auction. BUT THERE IS A HUGE SILVER LINING!!! 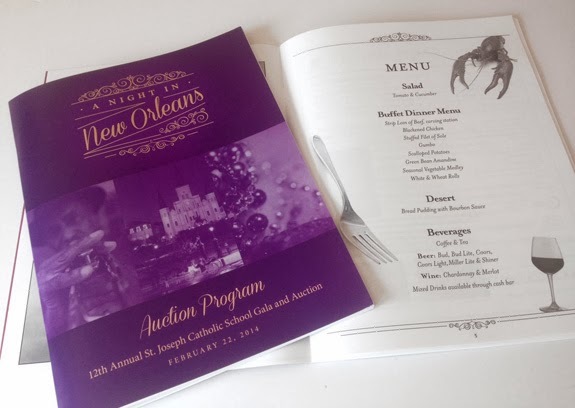 The local resource I had print the auction program (as a digital job in a relatively low-quantity run) did a GREAT job with it! AND AT A STELLAR PRICE!!! (Sorry for all the caps here, but I'm terribly excited). 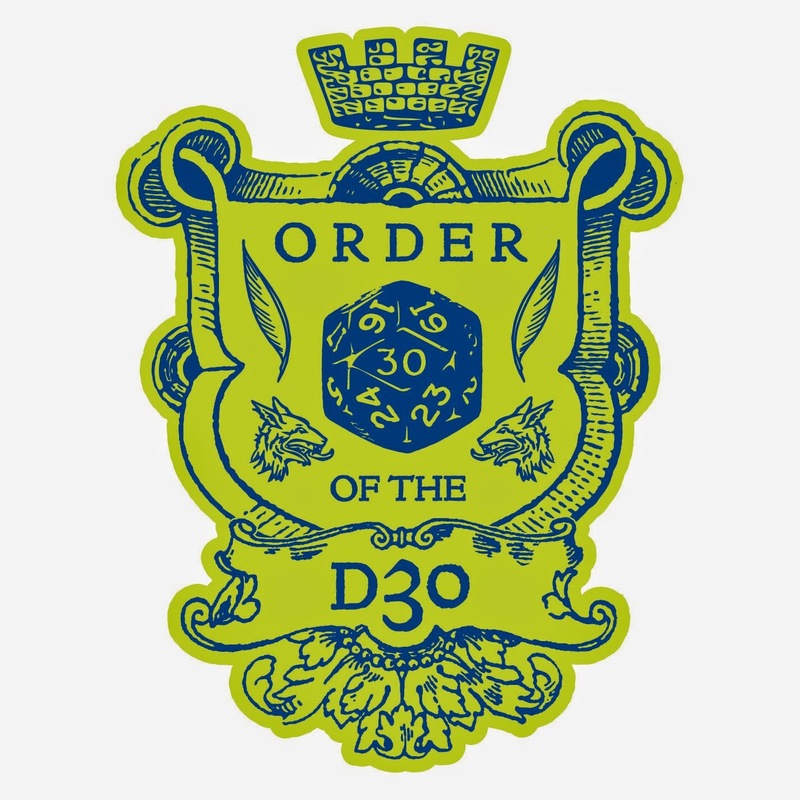 Everyone's incredible reaction to the d30 Sandbox Companion, as well as revived interest in the d30 DM Companion has given me a little bit of working capital. This working capital, as well as my recent discovery of a great local digital printing source will allow me to print and ship my own books. Unfortunately, right now, this shipping will be limited to continental US (with the possibility of shipping to Alaska and Hawaii via flat rate envelopes). More importantly, because I'll be getting a SERIOUS price-break on the printing (since I'm printing in quantity and not paying Lulu's awful markups) I think I can actually sell the book including shipping for the prices they are currently selling on Lulu.com (which doesn't include shipping)... and still be able to offer the occasional sale price! More importantly, I will personally see each copy that ships; if it's a faulty product, it won't ship. Simple as that. I've already started setting up my Square storefront. (I signed up with Square to be able to take credit cards when I sell at cons.) The products are already entered. I just need to set up a new bank account for record keeping purposes, and hope that completed by end-of-week. Then it will take a couple of weeks to get some inventory printed, and my shipping materials gathered and set up. If all goes as planned, I will transition sales from Lulu.com to my personal storefront in about 2-3 weeks. In the meantime, my products will still be offered through Lulu.com, but if you are reading this and thinking about buying a print copy, I suggest you try to wait for a few weeks. 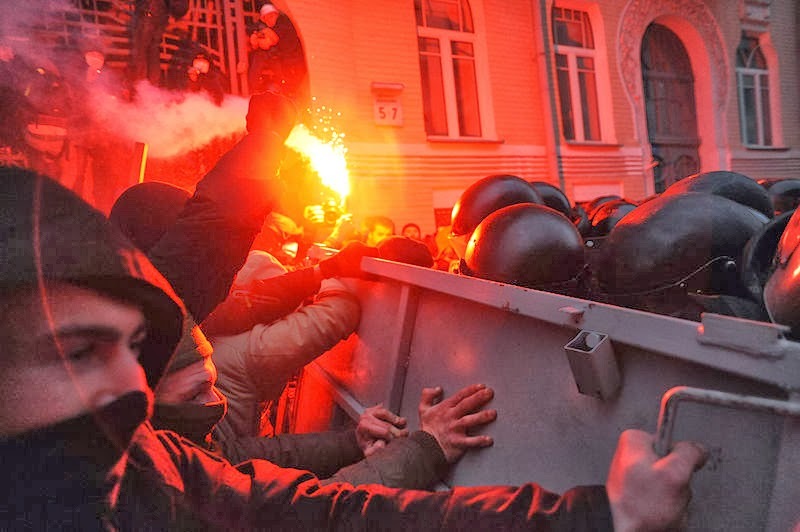 "Soldiers of Ukraine's Internal Troops in riot gear and protesters clash at Bankova str, Kiev, Ukraine. December 1, 2013" by Mstyslav Chernov/Unframe . Partly due to the recent events in the Ukraine, and partly due to the fact that Welbo and I are in the final stages of the pre-beta release of the Valley of the Five Fires wargame, and partly due to the fact that I'm having to give a serious "re-boot" of my blogging after a period of work-load inundation, I'm re-starting Riot Squad Saturdays. Now, some of you who've read these posts in the past may remember this is an idea I've had sitting around since the mid-90s. (Damn! Really? This idea is 20 years old? Wow.) Okay, anyway... back then, I'd only developed the thinnest of skeletons of an outline (e.g., movement was nothing more than a outline item labeled as "Movement"). I did, however, think through how I wanted the dice mechanics to work - simple counter vs. counter resolution, where (based on initiative) the "attacker" rolls and decides the fate of the "target". The charts were originally 4d6-based. Why? I have no freaking idea why I wanted something that cumbersome, or peaked at its center-point (percentile-wise in terms of chance of the result). But in re-looking at those charts, I realized 2d6 was more than adequate, provided more variance in result, and felt more "old school." Below are the adjusted charts (only the numbers under "roll" changed from a 4d6 to a 2d6 spread, otherwise, the content is essentially the same per the original mid-90s charts). At this point, my thinking is that movement will be scenario-based, and that game resolution will be primarily driven by the resolution charts. 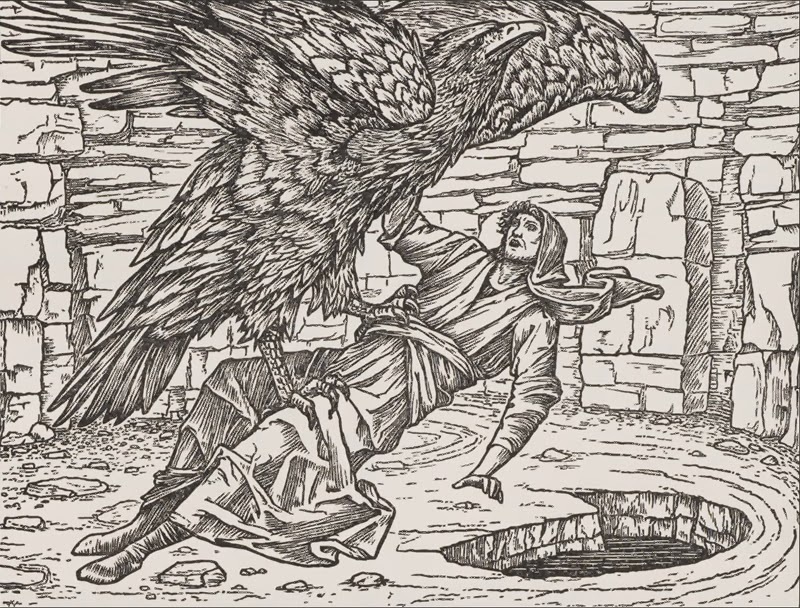 By comparison, the Valley of the Five Fires games requires a lot of referencing of the rules based on the specific encounter (e.g., there are 8 different types of place encounters, each of which has its own way of affecting the game). Ultimately, the Valley of the Five Fires game is encounter driven, while I see Riot Squad as very resolution driven. "Black Vulmea" Mike suggested an alternate condition regarding the arrival of media/reporters on the scene. This actually brings up a new discussion point regarding the game. Welbo and I have always tried to rely on the conceit that anything we develop for "old school" products (e.g., this sort of "zip bag" wargame) be seen from the POV of the time period in which we wished we'd developed the game. In 1980, that meant something much different than 2014, where social media outlets put things in the public eye within seconds of its occurrence. But I'm not opposed to offering "1980 Conditions for Victory" vs. "Contemporary Conditions for Victory," with the alternate rules conditions based on "the way things were" vs. "the way things are." Thoughts? Scenario ideas? Feel free to comment below. I know it's a been while since my last Monster Index, but this one's been a while in the making... and it's still just a beta version. By comparison, the Golem Index was a walk in the park. 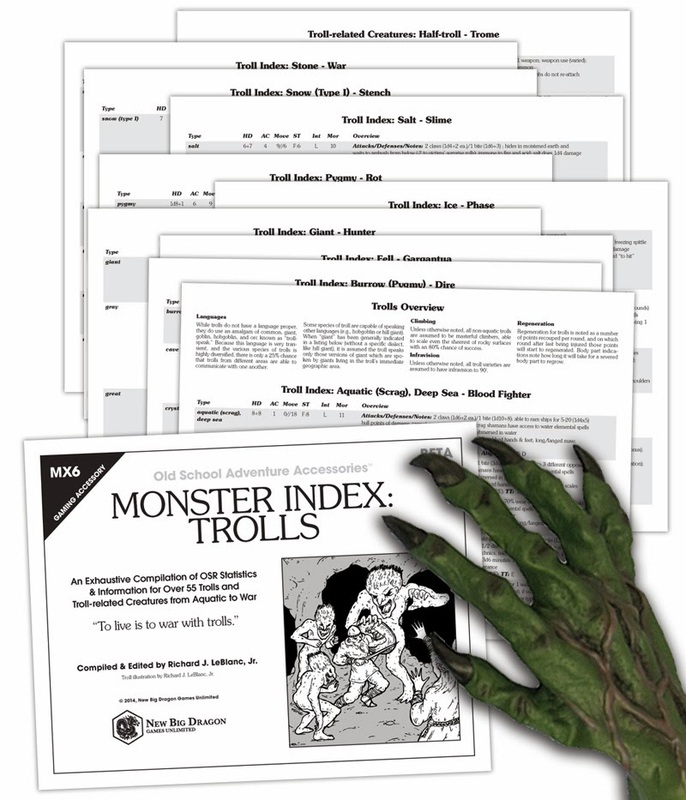 So today, you have at your fingertips a resource of 55+ trolls and troll-related creatures, including notes on regeneration for each. The other stuff is there of course (HD, Attacks/Damage, and the like). This is the first of the Monster Indexes that I'm officially referring to as a "beta" version, just because it was so overwhelming, I'm sure there are things that could be improved/expanded/etc. 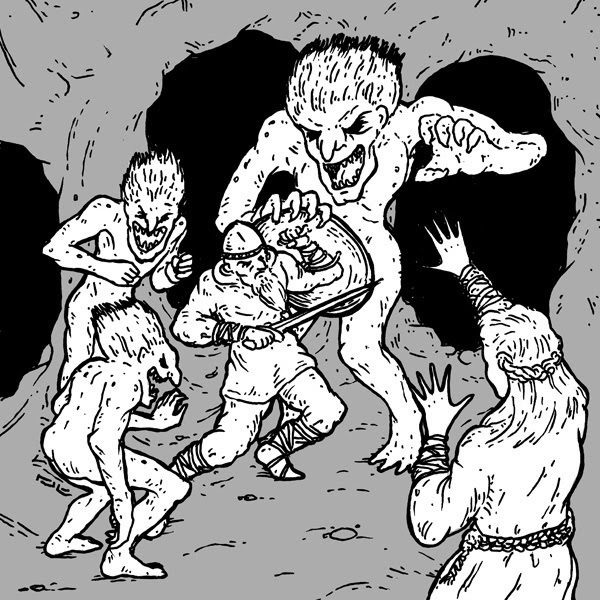 Old-school Adventures™ Accessory MX6 (Beta), Monster Index: Trolls. 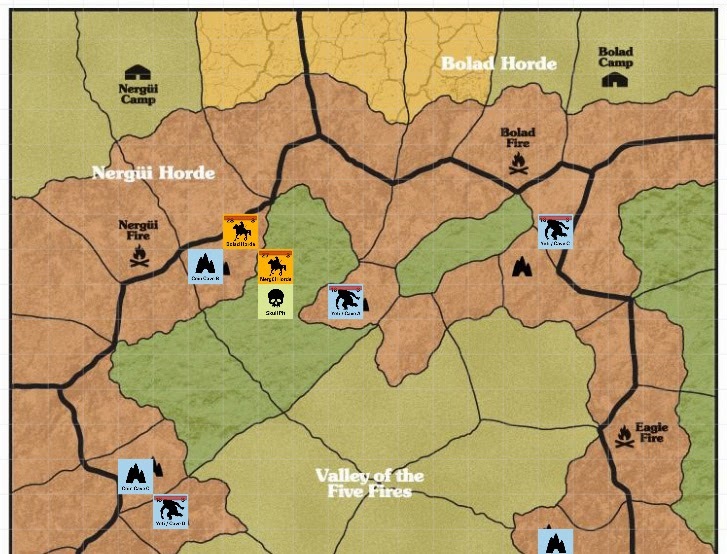 Welbo and I finally had a chance to dig back into playtesting the Valley of the Five Fires wargame last night (using Roll20 rather than face-to-face per our last test). Playing time was approximately 1 hour and 45 minutes from beginning to end (including a bit of set up). It actually went pretty damn well! I can't think of any play contingency encountered that wasn't already dealt with in the rules. And even though I was losing the entire game, the rules allow plenty of chances for come-from-behind victories (and even within the last couple of moves, I still had a chance to come from WAY-WAY-WAY behind and win). We actually played the entire thing out using the standard victory conditions, so 1:45:00 wasn't a bad time. From a personal project I'm working on right now. It's a troll attack where two young male trolls are egging on the troll that may or may not be their father. Any resemblance between the young troll at the upper left and the character Beavis (from Beavis and Butthead) is purely coincidental.